Do I need to update my broadband connection? I have just had a new computer delivered, to change over from this one, do I just unplug all the leads and replace them, and do I have to do anything about my broadband connection ? I am a 77 year old silver surfer so I apologise if you think this is a simple question. When it comes to technology there’s no such thing as a simple question. Most broadband connections use a router – a little box that connects to the Internet through the telephone (ADSL) or cable TV connection. The router deals with all the Internet connection details and the computer connects to the router. If that’s the set up you have, then all you’ll need to to is take the network cable connecting the old computer and plug it into the new system. If you have a wireless router then you’ll need to find the password you’re using. Some Internet connections plug straight into the computer though a dongle, a little USB device that handles the connection. If you have one of these, you’ll need an installation disk, password and will probably have to speak to the ISP’s support desk. One thing to watch when you do connect the new computer is that you may have a lot of updates to do for the system. Allow a few hours for all the important security patches to download and install, particularly on Windows computers. As far as power and other connections go, you probably can swap them straight away although if you have an older printer you may find there will be no connection for it. Who owns copyright on my emails? That’s a great question, Lesley and being a legal question it doesn’t have a straight answer. A strict reading of the various copyright statues indicate the original writer of a letter or email does have copyright protection. Although lawyers advise you should have a disclaimer asserting copyright at the end of your emails. Of course this doesn’t prevent “fair use” of your email’s contents, so key parts of it still could be still distributed if the extracts meet the criteria that determines fair use. Copyright law is a pretty blunt tool to use when it comes to email contents, it may well be there are various privacy laws, employment conditions or other legal restrictions depending on where you live and whether the emails relate to business or private matters. Generally it’s good manners to ask permission before forwarding an email containing sensitive information, however given the ease of copying of distributing digital communications, you should be wary of sending anything electronically that could embarrass or damage you. Some ideas on email etiquette are available on the PC Rescue site. Overall though, no-one has a “right” to do anything they like with emails they receive, there are both moral and legal issues with passing on any private information they come across, whether it’s by a letter, email or any other way. Note this is not legal advice and it is essential to seek guidance from a professional legal practitioner on your specific circumstances. Do websites keep downloading data? 1) If I open a webpage and leave it open without doing anything on it am i still using megabytes? 2)If am on a website steaming a video and I pause it am I still using megabytes? The answer is both questions is “probably”. In the case of the web page, many sites have a feature called auto-refresh, where the page reloads itself every few minutes to either show updated information or in an attempt to fool advertisers into thinking more people have visited it. With online videos, the reason it slightly different. To make viewing more pleasant, most online viewers use a method called buffering where the next few minutes are stored on the computer. Usually when you pause a video, the buffering continues so the download continues. If you’re concerned about the amount of data you’re using, then it’s best to shut down your web browser when you aren’t surfing the Inter. Which alternative to Internet Explorer should I use? I’m really worried about the latest warnings about Internet Explorer. What should I use instead of it? You’re right to be worried about using Internet Explorer, the program has shown itself over the years to have some serious security flaws. We’ve recommended for a long time that users should use alternative programs. Previously we’ve posted a list of the four main alternatives to Internet Explorer. These options include Mozilla Firefox, Google Chrome, Opera and Apple Chrome. Of the choices, Firefox is the most popular while Chrome is gaining fans because of its speed. The other two have their advantages as well and its best to download one and see if it meets your needs. Don’t try to remove Internet Explorer as it is an important part of the Windows operating system and there’s quite a few sites that will only work properly on Internet Explorer. So save IE for the sites that require it and use alternatives for your day-to-day web surfing. Social networks are great way of keeping in touch with friends, family and colleagues. With 500 million users, none is a more effective tool than Facebook. Keeping in touch with friends and relatives though does have a downside, sometimes you might give away more than you intend to. When you share with friends on a social service, everyone in your network can see what you are doing. To make things worse, many social media businesses will give away their customers’ private information to make a few dollars as the controversy over Facebook’s recent changes to their privacy settings and the company’s subsequent backdown shows . Because this information is valuable, organisations are prepared to pay for it and the bad guys are eager to trick it out of you. Given the risks of identity theft, stalkers or all manner of Internet crazies finding you online, it’s important to guard this information. Facebook don’t make it easy to protect yourself, but you can hide key information. The first, simple step to protecting yourself is to move as much data as possible off your profile – home address, phone number, relationships, sexual orientation, birth year – are a few things that simply don’t need to be online. Take off everything that could potentially cause problems, you may need to use some judgement on what you’re comfortable sharing with your online contacts. Birthdays are a good example of where you should use that judgement. Facebook’s quite a good tool for reminding you of birthdays, but your birth date is also an important part of identity theft. If you do want to share a birthday, never put your birth year in – your relatives and friends have a good idea of how old you are – and you might want to consider putting the date a day or two earlier than the real day. 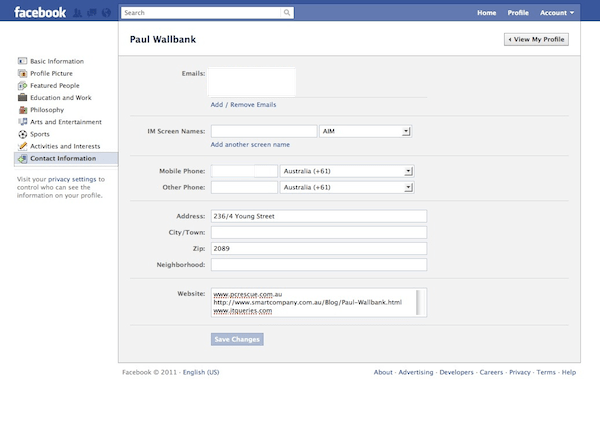 To change your Facebook profile information, click on the Profile link on the right hand side of your Facebook home page, you can edit all your details from there as shown below. Remember to click Save Changes after making each change and move between the different categories to ensure you’re only sharing what you’ve comfortable with. Facebook makes assumptions about what you want to share with your network of friends. This is not always in your interests and you should regularly review what your settings are as Facebook have a habit of changing how the privacy settings work. 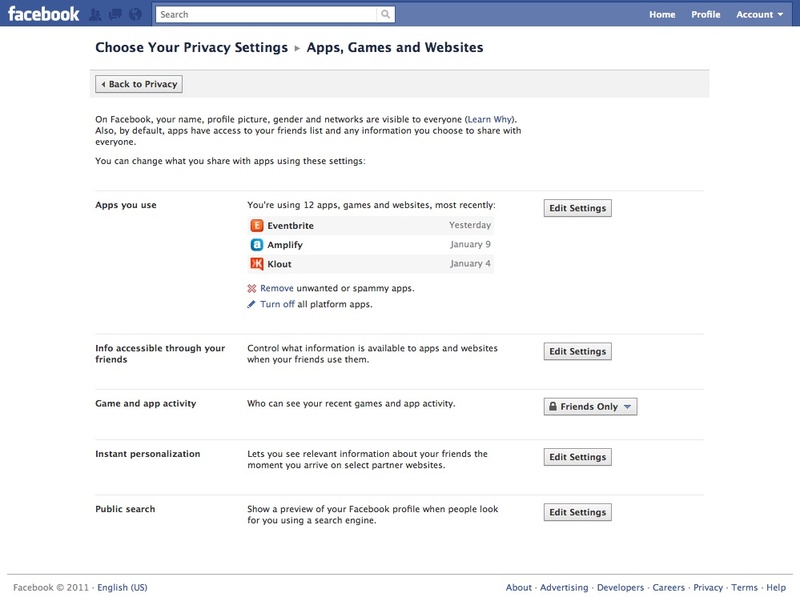 To enter the privacy settings, click Account and Privacy Settings as shown below. 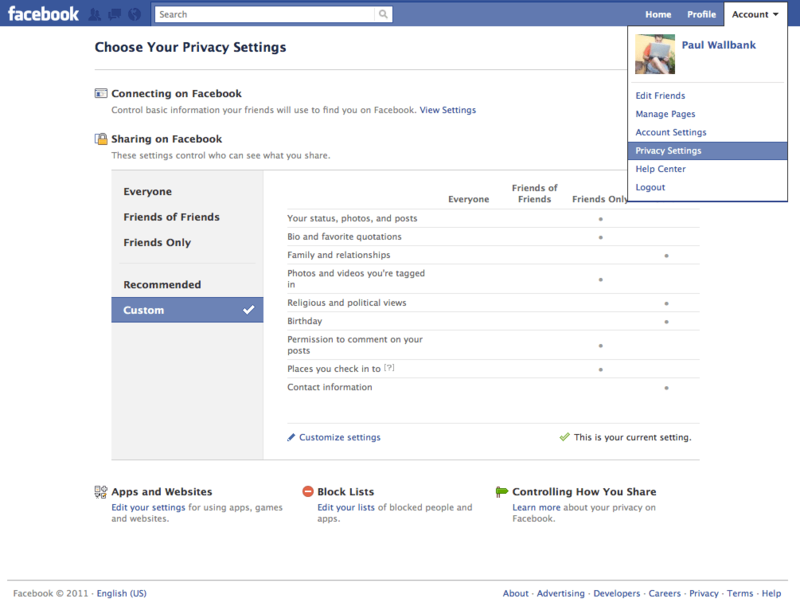 Once you’re in the Privacy Settings, click on Custom option and Customise Settings. You can then set your details to only be accessible to you or your friends. The following example shows a recommended configuration which may be suitable for you. Many people treat Facebook and other social media services as a competition to gain as many friends, connections or followers as possible. This isn’t the point and on Facebook in particular it opens you up to a number of risks. Once someone is your Facebook friend, they are privy to any information you choose to share and much of what your other friends post on your wall. The main risk is that new Internet is not quite as stable or honest as you thought. By accepting friend requests from people you don’t know you increase the risk of letting risky individuals into your life, your family and your group of friends. Another danger lies in the Facebook places feature which allows your friends to check you into locations. A malicious “friend” or a practical joke could see you being advertised as having checked into a place you really don’t want to be associated with. If you decide that is an acceptable risk, then revise the above recommendations on your profile information. If you are promiscuous in who you befriend online then be very careful about the information shared with them. Facebook applications are one of the reasons for it’s success. These applications – or mini-programs – allow you to play games, enter competitions and sign up with other services quickly. The proposed change in January 2011 to the information Facebook gives out to application owners would have allowed a lot of your personal information to be shared with third party developers. As it is quite a few of these applications “scrape” information from the various services you subscribe to. A good example is with Twitter where private, non-public, messages can be seen by some of these services. You should only allow applications to use your Facebook connection details if you absolutely trust them; right now, there are few services people can or should trust. If you have been allowing Facebook to connect your subscriptions to other websites, then you may want to review who you’ve given trust to. To do this, click Account then select Privacy as shown above. In the Privacy page click Apps and Websites and the page shown below will appear. By clicking Edit Settings you can then delete applications or change what they are allowed to do on your profile. Despite the risks of stalkers, identity theft and various privacy issues, Facebook is a valuable tool for millions of people who want to keep up to date with their friends, relatives and colleagues. By being sensible in choosing your online friends and what you share with them, it is a great website for keeping in touch with people you might otherwise lose track of. I have been trying to instal AVG Anti-Virus Free version 2011 on my home computer. I use windows XP. I went onto the internet and run the program to load it on,it then asked me to disinstall my Norton Anti Virus before proceeding to instal the applications. I did as instructed and then proceeded to run the program to install the applications. It showed 119mb.I left this program to run and it was loading on very slowly so I left it overnight. When I checked the monitor next morning there was a black window with BKR Saver on the top left corner showing and I couldn’t do anything to get rid of it to see if the program was still running.I started from scratch again yesterday and again this window came after a short while when installing the applications. It had however downloaded 37mb from the previous days attempt when the computer had been on for at least 8 hours.I am at a total loss as to why this is happening.Can you offer me any advice? The problem is with the AVG downloader package, it’s obviously not handling the download and the speed of your Internet connection well. The best bet is to download the package directly from the AVG Free website, make sure you choose the 16-bit program for Windows XP and avoid choosing the Windows downloader again. If that doesn’t work, there are alternative free anti-virus packages which we’ve discussed on our Three Free Antivirus Programs post. No, when you’re selling an expensive item you need to take care. This particular scam is a variation on the various check frauds where you’ll find yourself out of pocket from unexpected expenses that arise, a dispute over delivery or a reversed transaction into a hacked PayPal or eBay account. The fact the buyer isn’t concerned about the amount is a give away, along with the fact they are prepared to pay for freight to Malaysia. In situations like this you need to follow your senses; if something doesn’t smell or feel right then you shouldn’t go ahead with the deal. Remember – if something is too good to be true, it probably is.